Today I am promoting the hard working members of my street team, EtsyU. Juggling school work and social time and a day job is hard enough, but trying to make time for crafting can be difficult. It's important to us to let our creativity fly, helping to destress and unwind after a long day, but with deadlines (projects, tests, assignments, presentations, group work, etc) looming, it's hard to justify. While browsing through the shops of my fellow members, I cam across this cluster ring and fell in love. I just knew that I had to feature it today. 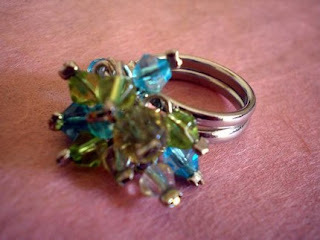 From the delicious shop of SugaNspice, this ring captures my favourite colour combination to perfection. It reminds me of the sea (that I've never seen, haha... so it reminds me of the lake too I guess), with tiny silver fish darting through the sun beams that cut through the water. It reminds me of shiny droplets of dew sparkling on individual blades of grass throughout the lawn. This ring makes me think of home (the country as opposed to the city I live in now for University). I found another fall bracelet - my favourite season and my favourite adornment, how perfect! 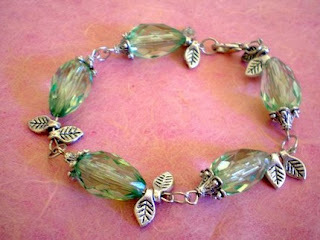 This Autumn bracelet with it's pretty silver leaves also reminds me of the spring - the beautiful faceted green beads remind me of a tree in full bloom. Delicate little buds coaxed to unfurl in the warming sun. It could easily be worn year round, and would make a lovely addition to any jewelry collection. Merely glancing at the two items I featured from SugaNspice would give you no indication on the variety found in her shop. 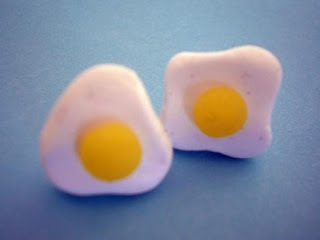 In fact, staying true to the name of the shop, many items are food and sweets inspired - like these adorable Fried Eggs earrings. So be sure to check out her shop!